I love brunch. It’s my favorite meal (in case you hadn’t noticed). But as is the case with most favorites, I tend to make the same things over and over again. I just love pancakes and hashbrowns and tofu scramble. In an attempt to fix that, I made Susan V.’s tofu omlettes this morning! My vegetable husband basket came loaded with tons of goodies this week–onions, baby bok choy, turnips, salad greens, etc.–and the giant bag of swiss chard was just begging to be played with. While Susan’s spinach and mushroom filling looked good, I julienned some chard leaves, piled them on top, and let the tofu cook. Needless to say, it was really good. Other features this morning included VwaV‘s tvp chorizo, my hashbrowns, and VCon‘s cheezy sauce. Spray a large non-stick skillet with olive oil and heat on medium-high until very hot. Pour the half the batter into the center of the skillet in a circular pattern about 6-8 inches across, and use a spoon or spatula to smooth over the top. Place your filling ingredients over the batter, and reduce the heat to low. Cover and cook for about 2-4 minutes, checking often to see if it’s done. When the edges have dried out, lift a small section with a spatula and check to see that the omelette is set. It will be golden in color, but not browned. When it’s ready, loosen the omelet by sliding the spatula under it from each direction, and then fold one side over the other. Repeat for the second omelette! 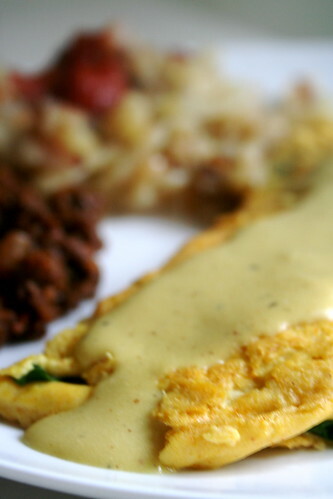 I usually make tofu scrambles, not omelettes, but now I’m seriously considering it! Looks great. I think i need to make these! Lovely photo (as always). I love the look of this recipe. Chard is one of the vegetables that tastes so good you’d think it’d be bad for you. That sounds really good! I need to grab a bunch of chard real soon! I’m heading to your place for brunch! And that would really be yum with that Vcon cheezey sauce!! i too love brunch – i know what you mean about get’n stuck in a rut. for us, it’s either bagels, tempeh bacon, pancakes, or hashbrowns (sometimes the occasional breakfast muffin). i think we need to change it up a bit! i’ve been a little intimidated by the tofu “omelettes” but i really need to give them a shot – especially after seeing how glorious yours looks! i’m a sucker for swiss chard, too! it’s one of my favorite greens (so’s kale right now!)! for cheezy sauces we’ve only tried susan v’s – but i think we’re gonna have to give vcon’s a go, too! yay! I need to get over my silken tofu phobia and make this, it looks too good not to give it a shot! sounds yummy! chard and tofu do really well together. i had an abundance this summer and made a couple different tofu-filled chard packets. it’s a great way to use it! MMMM…This would make the perfect Brinner! That looks awesome – thanks for reminding me to give this another go! I totally messed it up when I made this last time – by using a pan that was waaay to small. It tasted great just looked awful. Very nice dish! I ended up with something like this for Christmas: I thought I’d tuck the gravy into the oven to warm, ’cause it was done so early (it was made with Silken). It just … turned to scrambled eggs. They were good, though. Yum! I just tried her vegan quiche too..topped with Follow Your Heart Cheeze..that was pretty good.